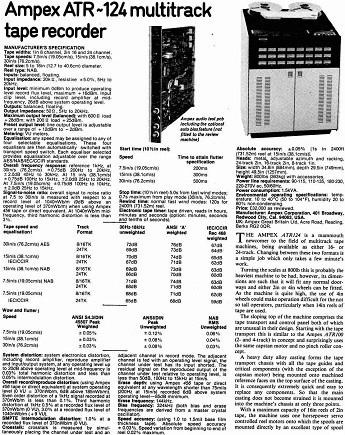 The Ampex ATR-116/124 provides up to 24 channels of audio recording/reproducing capability. The machine operates in any of three speeds: 7.5 in/s, 15 in/s, 30 in/s. The ATR-116/124 provides, through Sel Sync (Selective Synchronization), the capability of recording on one or more channels simultaneously while monitoring one or more non-adjacent, previously-recorded channels. This capability is exercised by using the record head of a previously recorded channel in a playback mode while using one or more other channels in the record mode. The ATR-116/124 recorder/reproducer includes a tape transport assembly, a head assembly, audio electronics assemblies, control assemblies, a power supply assembly, a meter panel assembly, and an input/output panel assembly. Multipin connectors are used extensively between units to facilitate removal and replacement of various components and assemblies. Forced-air circulation is also provided to dissipate heat generated when the recorder is in use. The recorder/reproducer does not incorporate a capstan pinchroller. Tape movement in all modes of operation is under capstan and reel servo control. The capstan servo controls speed and direction while the reel servo maintains dynamically constant tape tension. The ATR-116/124 incorporates such standard features as an electronic tape timer, search-to-cue, PURC (Pick-Up Recording Capability), dynamic braking, audio test circuit, and membrane setup panel. The tape timer displays in hours, minutes, and seconds the distance the tape has moved from a zero reference point. The search-to-cue feature provides automatic access to a preprogrammed point on the tape for editing. The PURC feature eliminates the problem of overlaps and holes in recordings when inserting (dubbing) new material within previously recorded programs. The system does not have mechanical brakes but incorporates dynamic braking to control all braking functions including stopping tape motion when power is removed. The audio test circuit provides I/O channel selection and connectors at the front of the machine for servicing and equalization setup. Foundational text courtesy of the AMPEX ATR-116/124 operation and service literature. 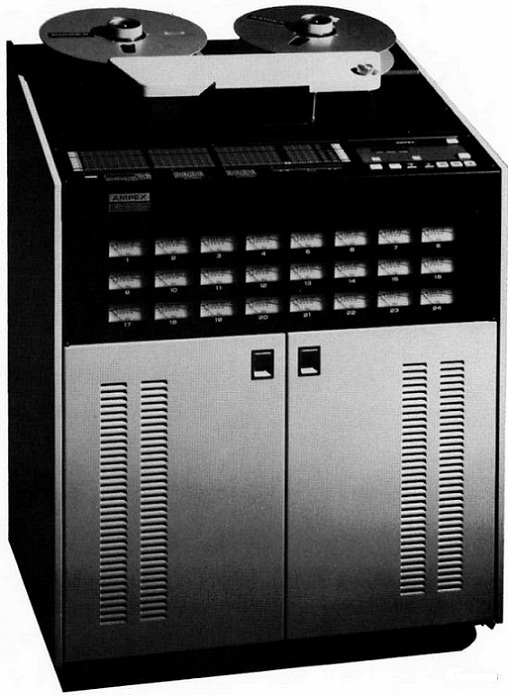 Do you have content, to add, about the AMPEX ATR-116/124 Tape Machine or associated topics? Please feel free to Share it, here!